Fighting insomnia can become serious business if you’re pregnant. Most women suffer monthly sleep disturbances due to PMS, but nine months of pregnancy can inspire increasing difficulties in maintaining a worthwhile sleep cycle. To compound the problem it’s not uncommon for pregnant women to suffer transient, or temporary, restless legs syndrome, a particularly disruptive sleep disorder. The popularity in maternity pillows owes to their effectiveness in reducing sleep discomfort while pregnant, thus delivering you a longer and more restful sleep, which is exactly what you need for yourself and your baby. Body pillows in shapes that resemble the twists and curves of a paperclip or a candy-cane are designed in a variety of configurations to support your changing body. 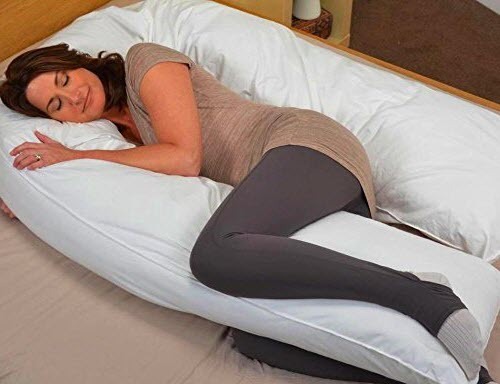 Essentially these types of pregnancy pillows wrap around your body holding you in a cushioned nest, but let you support your legs and hips, belly, neck, and lower back. Wedge-shaped styles support your belly and lower back and are usually made of firm foam or memory foam. Other features you may find packaged in a pregnancy pillow include hypoallergenic materials, soft washable covers, washable and dryable at home, memory foam materials. Eliminate caffeine and sugary stimulants from food and drink well before bedtime. Not only can these interfere with your sleep pattern, but with that of your baby as well. If your baby’s awake and kicking, so are you. Stick to a routine bedtime and waking time. Cut back on water closer to bed and reduce the number of times you need to get up in the night to urinate. Stick to a regular exercise routine even while pregnant—under supervision of a doctor, first.